If I patron a restaurant where shaved sprouts salad is an option on the menu, there’s a solid eighty percent chance that I will order it. It’s just that good! Brussels sprouts have become a recent favorite of mine (I’d never eaten them as a child), whether in shaved or oven-roasted form. It’s like a miniature cabbage, and miniature things are always so much cuter than their full sized counterparts, wouldn’t you say so? 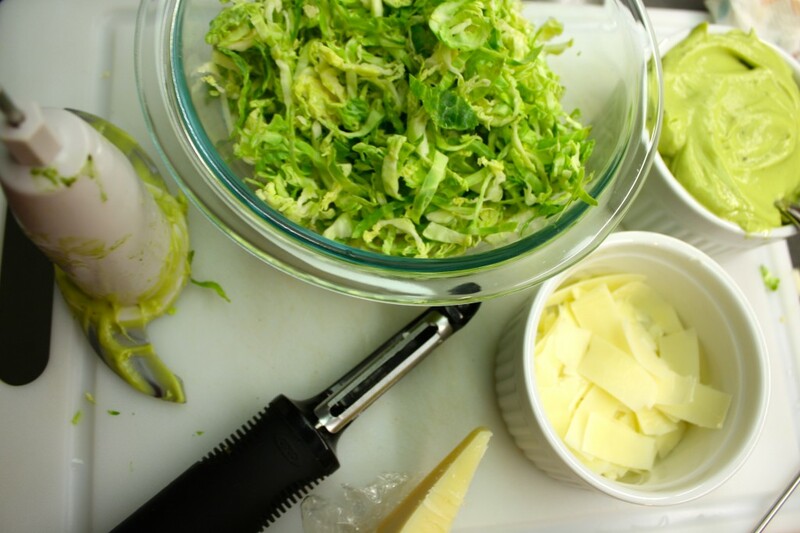 Shaved sprouts certainly brings out a different taste and texture than oven-roasted sprouts. It’s raw, so thin shavings yield a crunchy, slaw-like resemblance which makes for a rather refreshing and unique salad base. This simple salad is delightfully flavorful, and a play on the Ceasar salad—which happens to be one of my favorite classic salads. Thinly shaved Brussels sprouts (can be done using a mandolin slicer or by hand using a sharp knife) are tossed with a homemade healthy avocado dressing (click for recipe), and topped with a generous portion of shaved Parmesan cheese (I used my trusty vegetable peeler), roasted chopped almonds, and a sprinkle of salt and pepper. I even threw in a few roasted sprouts for a “two-ways” dish! It’s a beautiful and delicious dish perfect for the summer! 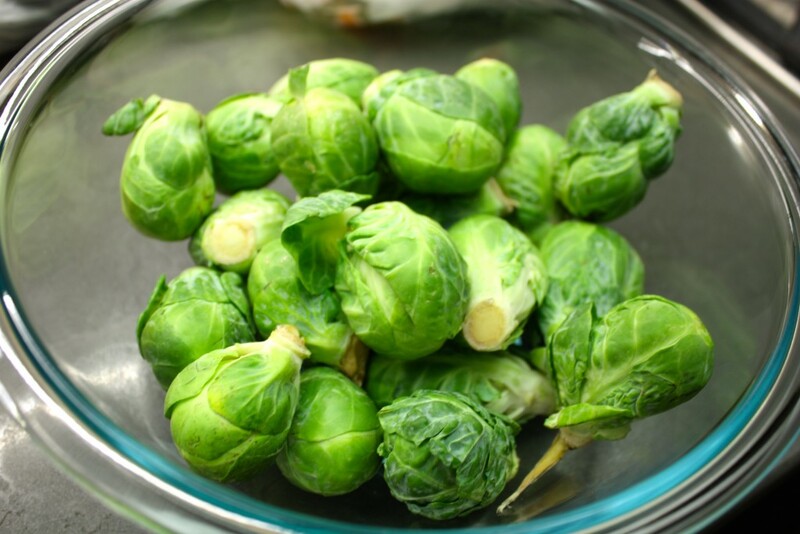 Wash and shave brussels sprouts. This can be done with a mandolin slicer, or with a sharp knife. 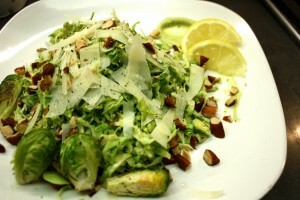 Toss shaved sprouts with avocado dressing and almonds. Plate tossed salad and sprinkle shaved Parmesan cheese on top. I used a regular veggie peeler to create beautiful Parmesan ribbons! Optionally, drizzle olive oil over the top of the salad. Garnish with freshly ground salt and pepper, and enjoy! Happy cooking and thanks for dropping by!